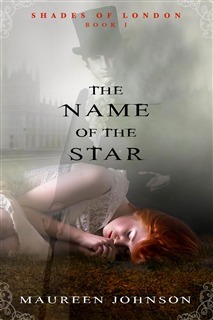 The Name of the Star by Maureen Johnson was a very.... weird read. I honestly thought it was going to be a mystery contemporary book, but I never expected it to have a paranormal twist. The main thing that annoyed me was how unrealistic the events were. I just couldn't understand how this was going to end or even get solved. Not only did I feel like the book was unbelievable, every chapter felt very similar as well. The pace was very slow, and not many exciting events occurred either. Rory, the main protagonist, goes to a boarding school. I love books with a boarding school setting, so I had high hopes for this one. When Rory moves to London to attend her school, there is a murderer there whom they call "The Ripper". Apparently it's all over London, and the killings are horrid. The thing that totally annoyed me is that why couldn't Maureen Johnson just keep it a normal murder mystery that can at least seem realistic? Then the story just gets more confusing when Rory actually sees ghosts, and it turns into a paranormal story. I don't want to have any spoilers in this review, but I will say, I did not like the fact that it had a paranormal twist in it. Overall the writing was good. I would get lost in some parts, but happens very often. The ending was okay, but I don't think i'll ever pick up the sequel to this book. I might not have enjoyed it, but do give it a try! Great review! It sounds interesting although there seem to be some 'flaws'. I'll take a look for myself as soon as I can get a hold of it. Perhaps you would like to take a look at Teenage Fiction? We have an Insurgent review too, maybe we can compare our opinions? Ouch. I tend to like Ripper books, because that's an event that fascinates me, but this one sounds like it completely missed the eery charm of the historical situation. Slow, uneventful, unreallistic.... Nope, not for me. Argh, I did not love this one either. And I usually LOVE Maureen Johnson. It was disappointing! Maybe because I had such high hopes? I think your "I might not have enjoyed it but give it a try!" sums up my feelings perfectly! What a fun book to read! The main character, Rory's parents move to England for business and she decides to attend a private boarding school- to get the whole "English" experience. Shortly after moving in, bonding with her roommate, crushing on a guy, and secretly despising the resident "perfect" girl- tragedy hits London. Someone is murdering people in the same fashion and on the same days that Jack the Ripper struck years ago.